As the Challakere kavals are turned into a strategic research complex, hard questions remain about whom these grasslands belong to – and what they really are. Challekere: Challakere’s grasslands are marked with memories of water. In this otherwise flat, arid landscape in Karnataka, feathered with brown-gold grass, cavities in the land point to the work of the monsoons. An empty creek bed is laced with scrub, a hollow that will transform into a lake when filled with rain. The promise of water is in these contours, but that promise often fails to deliver. More than half of the last 100 years in Challakere have been drought years, including all of the last five. Given this scarcity, it was natural that water would be the central concern at a public meeting held this April. Farmers, community leaders and activists are worried about the continued sustainability of life here – but their present worries do not only stem from drought. Rather, what has fuelled current anxieties is that most of Challakere’s ancestral grazing lands, along with many of its water sources, now lie behind high walls and barbed wire. Traditional livelihoods here are adapted to a meagre monsoon: agriculture is confined to low-rainfall crops such as groundnuts. 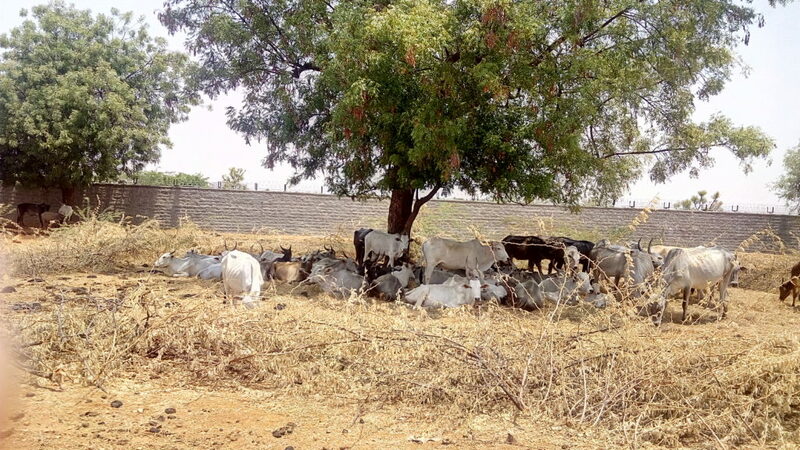 The mobile, pastoralist livelihoods that sustain much of Challakere’s economy, with the rearing of cattle, sheep and goats, are also well suited to an arid climate. The grasslands here were once among the best pastureland or kavals in Mysore kingdom. In the 18th century, Hyder Ali and his son Tipu Sultan set aside kavals (themselves dating to at least the Vijayanagar Empire) for Amrit Mahal cattle, a strong, fast breed used as a war-time draught animal. 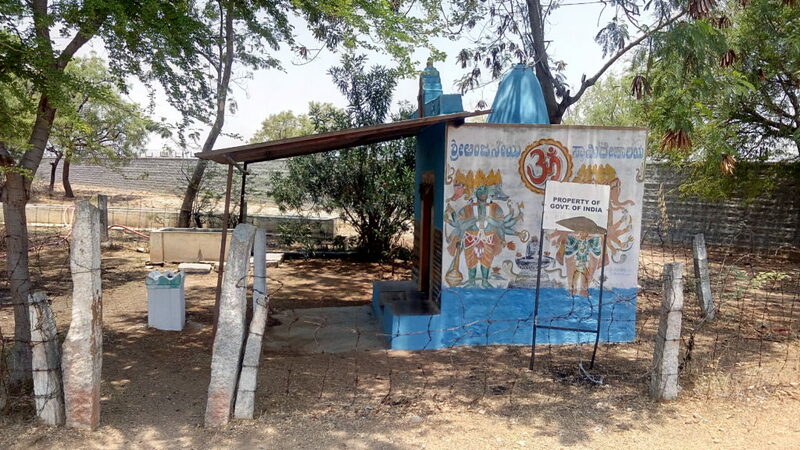 Over the past two centuries, as the breed diminished in strategic importance and in numbers, the ‘Amrit Mahal Kavals’ across Karnataka have nearly disappeared beneath encroachments. In Challakere, the kavals remained intact. Between 2009 and 2010, however, roughly 10,000 acres of Challakere’s kavals were diverted by the government to form a ‘Science City’ of military, scientific and commercial establishments. These include a uranium enrichment facility and an airstrip for drone testing, the former being built by the Bhabha Atomic Research Centre (BARC) and the latter by the Defence Research Development Organisation (DRDO). The other institutions making up the Science City are the Indian Institute of Science (IISc), the Indian Space Research Organisation (ISRO) and a private firm called Sagitaur, which intends to develop solar technology on its land. What these developments have in common, apart from their predominantly military focus, is that their arrival in Challakere took residents by surprise. Panchayat leaders did not know they would have a Science City in their midst until the walls began to go up. Sixty villages found themselves fenced off from kavals where they had grazed livestock, foraged for medicinal and edible plants, and obtained mud, rocks and wood for construction. The kavals had also supported local basket-making and blanket-weaving, the latter supplied to the Indian army. Locals have been protesting the loss of livelihoods, but as construction proceeds, this loss is being compounded by rising water insecurity. Challakere’s average 457-mm annual rainfall just about supports its traditional agriculture; groundwater levels here range from semi-critical to critical. It remains unclear how the Science City will satisfy its water needs, once fully staffed and operational. Uranium enrichment in particular is both water-intensive and potentially water-contaminating. There is a plan to supplement drinking water in the Challakere taluk with water piped from the Vani Vilas Sagar Dam 60 km away. Critics point out, however, that the dam itself is seldom full. Challakere villagers fear that the difference between demand and supply will be resolved at their expense. Until this decade, the Challakere kavals were an enduring example of how disparate communities can manage resources held in common, even when those resources are scarce. Jahnavi Pai, an independent ecologist who has studied land use in the Amrit Mahal kavals, found Challakere’s unusually well-cared for. Most Amrit Mahal kavals that Pai saw had been built over, replaced with tree plantations or overrun by invasive species. In Challakere, despite centuries of human use, the kavals were free of encroachment – one reason why the unfenced land was so easily appropriated in 2009. From common grazing lands used democratically, where blackbuck thrived alongside human activity, the Challakere kavals have now turned opaque to debate. Roads have been blocked and at least one check dam built without consultation. One lake is split between ISRO and a village community, without much room for open dialogue about water rights. The Science City’s planners cite its military importance to justify the lack of transparency. But that secrecy has meant an uphill struggle for villagers, local leaders and activists who believe the large-scale land diversion is already affecting both the local economy and ecosystem. Arguing that the diversion was illegal, residents of Challakere taluk went to court. An agricultural collective called the All India Kisan Sabha, affiliated with the Communist Party of India, filed an initial petition with the Karnataka high court in 2012. The Amrit Mahal cattle might be almost gone, but locals said that legally they were entitled to enough land to support existing livestock. They also argued that Challakere’s grasslands deserved protection as “forest land,” a category that in this case indicates high biodiversity. What they received from the high court, however, was a fine of Rs 75,000, for attempting “to thwart the work of development carried on in national and public interest.” An appeal to the Supreme Court only led to the repeal of the fine. In 2013, the Environment Support Group (ESG) represented the Challakere villagers before the National Green Tribunal, arguing that none of the organisations had sought environmental clearances before starting construction — especially problematic given that the developments included a uranium enrichment facility. Before the court, ESG and the Science City-planners conjured different worlds. ESG described the grasslands as bursting with life, from blackbuck to foxes and chinkara, and as a potential habitat for the great Indian bustard. The Science City organisations described an unproductive wasteland, which they meant to “improve” with new plantations. ESG protested the loss of pastoralist livelihoods. The Science City planners promised new jobs, schools and a higher standard of living for the entire area. The National Green Tribunal balanced these competing realities in its final judgement with a single deciding principle: that sustainable development must be tilted towards activities of “national importance.” The military installation at Challakere’s Science City was given the green light, pending environmental clearance, since it was judged to be an instrument for the greater good. At the public meeting in Challakere this April, representatives of the Science City were noticeably absent. With few channels of communication with the planners, villagers have been left to speculate about what is happening beyond the barbed wire. 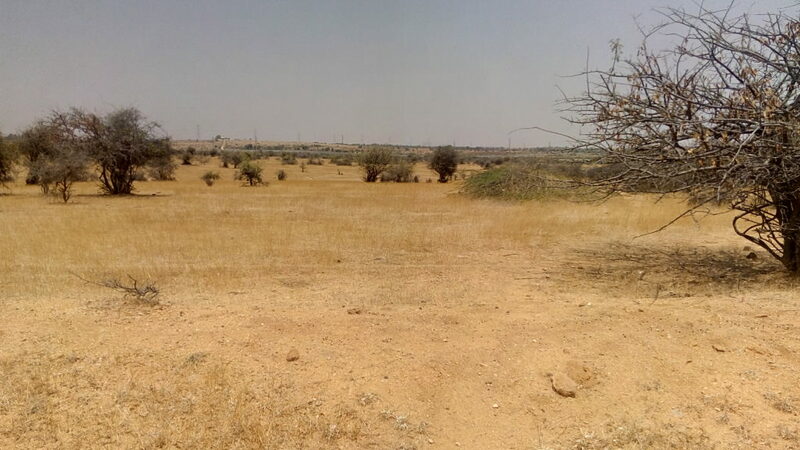 In December 2015, a village lake ran dry for the first time in living memory. 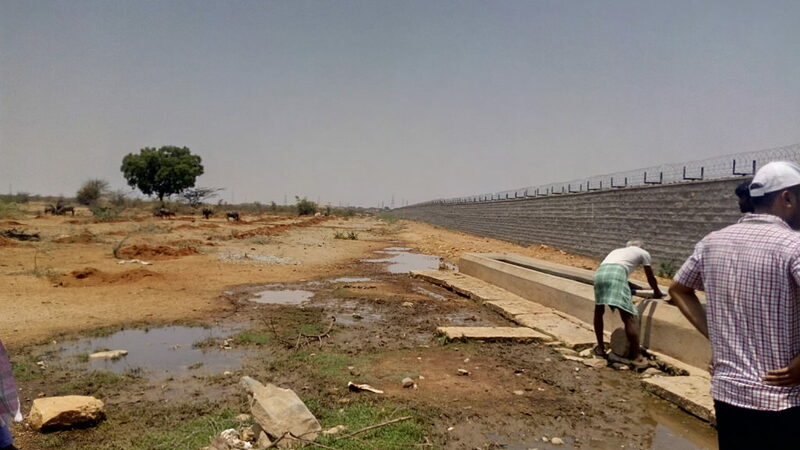 Five consecutive drought years may have been a contributing factor, but according to Leo Saldanha of ESG, residents believed that work on the IISc campus was blocking the water’s flow. There was no way to check, since guards blocked entry and the walls were too high to climb. Upon investigating, ESG found that IISc had built a check dam on a river on its campus, upstream of eleven lakes — including the one that went dry. IISc civil engineer Mohan Kumar claims that IISc had only rebuilt the check dam and that the construction was planned so that water would percolate into the soil and recharge the groundwater. Kumar makes a similar argument for the tree plantations the Science City has begun to grow: a temporary reduction in surface water-flow will be compensated by future groundwater recharge. Given that groundwater levels are critically low across much of Challakere, Kumar says IISc’s actions assure long-term benefits for the area. Kumar’s arguments were not shared or debated at the public meeting, however. And debate is critical when it comes to water use, in an area where half of the 101 farmer suicides between 2003 to 2007 were directly attributable to drought-related crop failure. 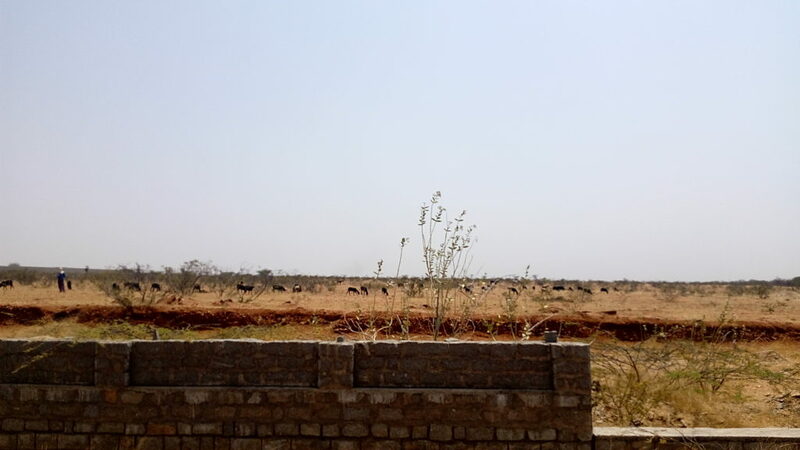 Development at Challakere also misunderstands the nature of grassland ecosystems, says Abi Tamim Vanak, a savanna ecologist with the Ashoka Trust for Research in Ecology and the Environment. Grasslands are devalued the world over, often treated as degraded forests that must be re-engineered to have value, through afforestation, irrigation or construction. India retains only fragments of its once-vast savanna grasslands and those fragments tend to be categorised as wasteland. We can measure the degradation of India’s grassland ecosystems by the fate of their resident species: from the long-extinct Indian cheetah to the near-extinct great Indian bustard, the endangered lesser florican and the threatened blackbuck. Vanak points out that the Science City’s plan to recharge groundwater by greening the landscape will take away the habitat of local wildlife. These plans also ignore real ecological constraints. Research suggests that below 650 mm of annual rainfall, there is a limit to the density of trees a landscape can support. “It’s basic ecology,” says Vanak. “In semi-arid environments, more soil moisture is lost due to evapo-transpiration from trees than from grass.” This explains the very existence of savanna grasslands, which thrive in low-water conditions, sustained over millennia through repeated destruction by foraging and fire. Likewise, pastoralist lifestyles have thrived here by remaining responsive to the rhythms of a harsh but resilient landscape. For B.N. Raghunandan, professor of aerospace engineering and chairman of the Challakere Development Committee at IISc, development will always come with a cost. “You need to pay the price somewhere,” he says. These words raise questions which the judgement does not answer: How much inconvenience, in light of what greater benefit, to which people? And in whose interest is it to devalue water security, sustainable rural livelihoods, the survival of endangered species and democratic dialogue, in favour of commercial profit and national defence? The patterns of change that have swept over Challakere are old ones. The British Empire classified land based on its revenue potential, in England and colonial India alike. Public commons, such as lakes or village pasture, defied a logic of governance which valued land based only on its capacity to turn a profit. The result in 18th- and 19th-century England was the ‘enclosure movement’, which left thousands locked out of their common lands, walled off from ancestral sacred spaces and torn from their community. In India, the erosion of the commons that began with colonial policy continues today. Challakere is an example of just how much that policy cannot see. Indian law gives no specific protection to common lands. Forests are protected, historically important to the British as sources of timber, but grasslands are often classified as waste. Nationally unimportant, entire worlds slip through the cracks, provoking little comment as they vanish without a trace . Like so many others in Challakere, former panchayat member Karianna is worried about water. He is also worried about the secrecy surrounding the Science City. 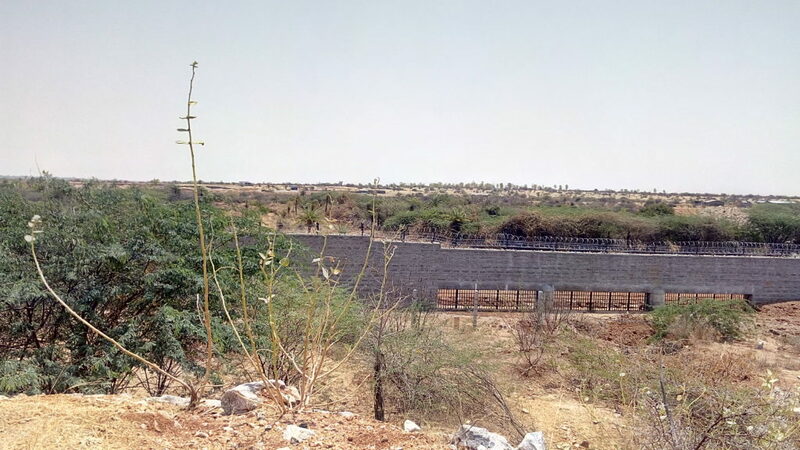 The Ministry of the Environment and Forests has given environmental clearance to the uranium enrichment facility, which BARC is building only kilometres from Karianna’s home in Doddaullarthi village. Despite orders to the contrary from the Central Information Commission, the ministry refuses to make that clearance public due to the establishment’s strategic nature. If the facility were ever to contaminate the local water supply, Karianna says that the disaster would be compounded by this veil of secrecy – and by the established lack of accountability to local people. Karianna says he is not, in principle, against the kind of development taking place here. If it is for the good of the country then it should happen, he says. But there are ways to do it that keep local needs and health in mind. Before the public meeting, one man raises a point of criticism with Karianna about the villagers’ continued protests. The Science City at Challakere was planned by the central government. Its support comes from the very top. Is it right to go against that? “The people are the government,” Karianna replies. This sentiment, spoken quite readily, has received little support in this area lately. As the Science City comes close to starting operations, behind barbed wire strengthened with patrol roads, it remains to be seen if communication on either side of these walls will improve one day. Thanks to Naveen Jingade for help with translations. Anjali Vaidya is a writer living in Bengaluru and California.